Yam which is also called as elephant foot yam / suran/ senaikizhangu / chena etc which grows well in Africa and Asia and has numerous health benefits. The consumption of elephant foot yam helps to lower the bad cholesterol. Likewise continuous eating of yam for days will lower the blood sugar level in a diabetic person. Now a days people are interested in weight loss and diet meal. Yam is considered as one of the best food to eat for those who are in diet or weight control. They are full of fiber which makes our tummy full and thus we eat less food. The cooling property of yam benefits during hot summer. Consumption of elephant foot yam during the hot summer helps to cool our body as well. 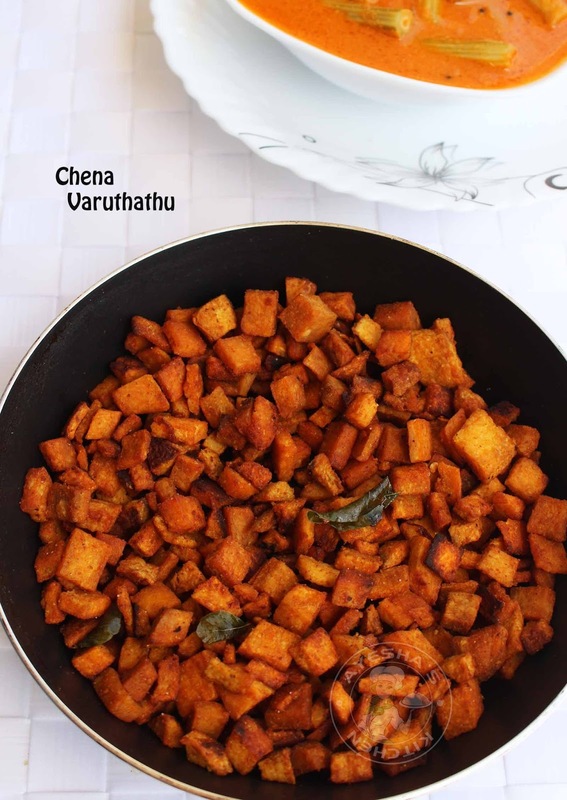 Today am here with a chena fry or yam fry / chena varuthath or porichathu/ senaikizhangu/ yam fry recipes. Peel and cut the yam into small squares after washing. Marinate it with chili powder, turmeric powder, coriander powder, salt and set aside. Heat a pan with 2 tbsp of oil. Add the marinated yam / senaikizhangu along with curry leaves to the hot oil. 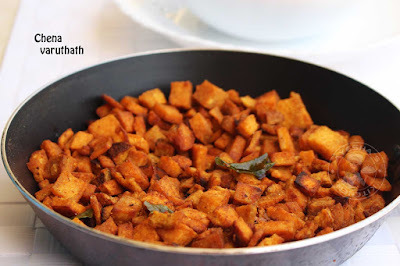 Fry the yam over a medium flame until it becomes soft inside with crisp outside. Saute occasionally.